ImaGem Lab Express System is an integrated system that combines equipment and services to provide laboratories, diamond manufacturers and jewelry retailers with a customized solution for their grading needs. Grade Polished diamonds for Light Behavior, Color, Clarity, Fluorescence, Proportions, Symmetry and Digital Fingerprinting. Grade fancy color diamonds and diamonds with secondary hues, such as browns and grey. Grade Rough for Color range, Clarity, Fluorescence, Fingerprint, Measurements, Diamond Testing, Carat Weight and Price Evaluation. 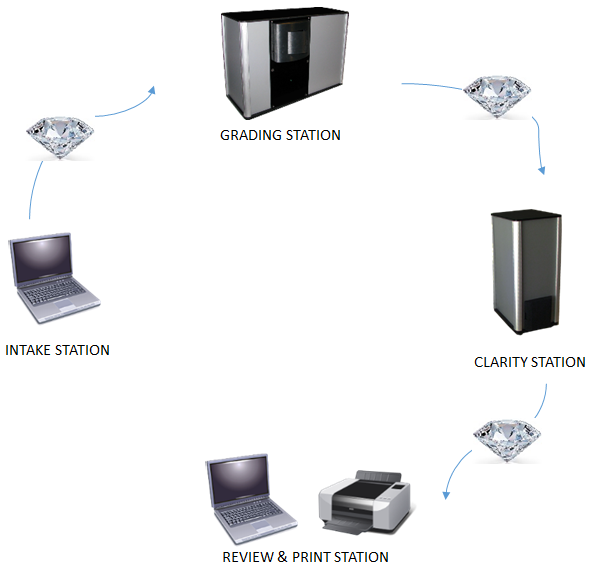 The system illustrated here, consists of 4 stations – Intake Station, Grading Station, Clarity Station and Review and Print Station. Other configurations are available. Intake process marks the start of a diamond’s grading process. Important data is captured at this station and a Gem ID is assigned to the diamond. This ID enables the tracking of the stone as it moves through the process and any time thereafter. In some special configurations, a VeriGem machine may be added as part of the Intake process to register the diamonds using ImaGem-Secure TM. After the Intake process is complete, the diamond is graded using GL3200 Grader machine. All data related to the diamond’s color, fluorescence, light behavior, registration, proportions, symmetry, alignment and images are recorded in just under 4 minutes. After processing is complete, the data is displayed on the screen and placed in a data file. One person can operate as many as five grading stations simultaneously. Upon completion of the Grading process, the diamond is processed on the GL5200 Clarity machine. Using a trained operator and automated processes, the diamond’s clarity grade is assigned. The results are entered to the gem’s data file. At this time, all of the previous grading information, including any information that may have been sent electronically by the customer or part of the customer profile, is displayed. The gemologist examines the diamond and independently verifies the grades and confirms the information. Once the information is confirmed, a certificate can be printed. Thus, in about 10-12 minutes, the entire grading process is completed. For further information or to order equipment please contact ImaGem Inc. by phone +1 215 477 9920 or by email to info@imageminc.com. *U.S. Pat. No. 6020954, 6239867 and 6980283.